Country of Origin: Persia, England. INCI: Juglans Regia (Walnut) Seed Oil. Common Names: Tropical walnut, Colombian walnut, Nogal, Ecuadorian walnut, Nogal Bogotano, etc. Walnut oil is known to help with restoring memory and attention. It is great for retaining information and examinations. The perfect balance of vitamins gives a positive effect on the nervous system, relieves fatigue, and normalizes sleep rhythm. It is recommended for children and young people as it promotes valuable mental and physical maturation and development. It can also be used by elderly people, as a complete vitamin supplement. 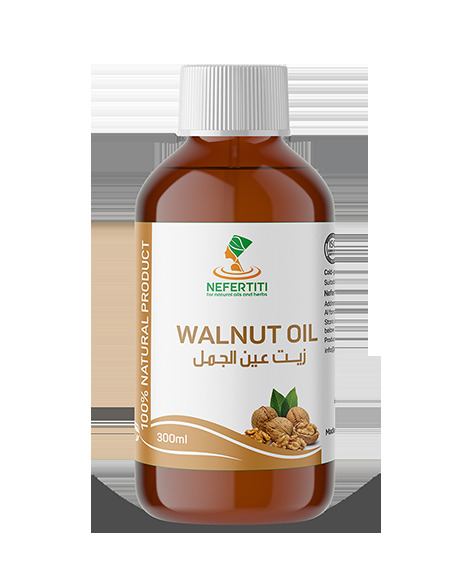 Walnut oil is a well-known treatment in cardiovascular diseases. It strengthens the heart muscle, strengthens the walls of blood vessels, prevents thrombosis, and expands small blood vessels. Walnut oil is widely used in the treatment of digestive tract diseases: gastritis, colitis, stomach wounds, reducing gastric acidity. Regular consumption of Walnut oil reduces breast, ovarian, colon, and prostate cancer risk, and improves renal function. Its also promotes regular flow of the bile, increases the elasticity of the bile ducts. It can be used in different ways. It can be used as a supplement in family planning – cold pressed Walnut oil stimulates spermatogenesis. Walnut oil can also be used to treat fungal infections like Candida, jock itch and athlete’s foot. It also has the following properties; antiseptic, anti-inflammatory, anti-bacterial, anti-fungal, laxative, analgesic, anti-aging, anti-cancer and regenerative. It is often used in food. It can be drizzled over salads, as a flavor for fish/streak and be used with pasta. Why using pure natural walnut oil instead of the nuts? : CAUTION! Walnut kernels harmful to eat when you have cough, bronchitis, angina, allergy, asthma, inflammation of the lungs, hives, eczema, psoriasis, atopic dermatitis. Not recommended for people with gastritis, colitis, enterocolitis, gastric ulcer and duodenal ulcer. Excessive consumption of nuts can cause headaches and even vomiting. I highly recommend this product because of its great quality and freshness. I use a tablespoon a day as part of my salad dressing which is walnut oil and balsamic vinegar. I read that Cold Pressed Walnut Oil helps in maintaining good cholesterol levels of course with a healthy diet and exercise, it really serves for my health and diabetics.